Our tastes are often established at a very young age. As a child in the 1950’s I can remember the exciting trips to the Los Angeles China Town. Sure, it was tourist attraction and the shops catered to the American idea of the Orient. Strange and exotic sights and smells awaited and my sister and I took it all in. We were especially attracted to the inner courtyard and the Chinese restaurants. What we saw, what we smelled, and what we ate there pretty much established our idea of what Chinese food was all about. I suppose I should rephrase that. As we are astute enough to know Chinese food here in the States is more correctly a style adapted to American tastes, our ideas of how Americanized Chinese food should look, smell and taste was implanted and had remained there ever since. To that end I have sought the perfect sweet and sour sauce to make at home. I have tried many varieties and have had some successes but I never felt that any of them was just right and so the search went on. The other night the wife and I were invited to Abbie and Mariano’s house for dinner. 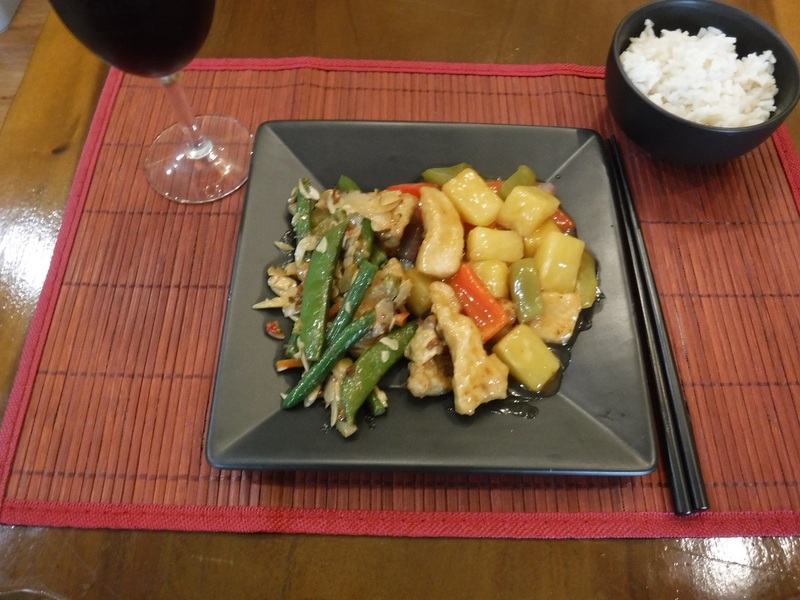 Everything was delicious but two of the dishes, sweet and sour chicken and Chinese spareribs, were particularly good and I wanted to add them to my repertoire of recipes. After all, Abbie’s sweet and sour sauce was spot on and evoked the taste of Los Angeles’s old China Town, of the long gone General Lee’s Restaurant (1878 - 1985), a taste that continued to evolve with visits to the now legendary Phil Ahn’s Moon Gate Restaurant (1954 - 1990). Come and prepare a sweet and sour sauce reminiscent of the masters of old. 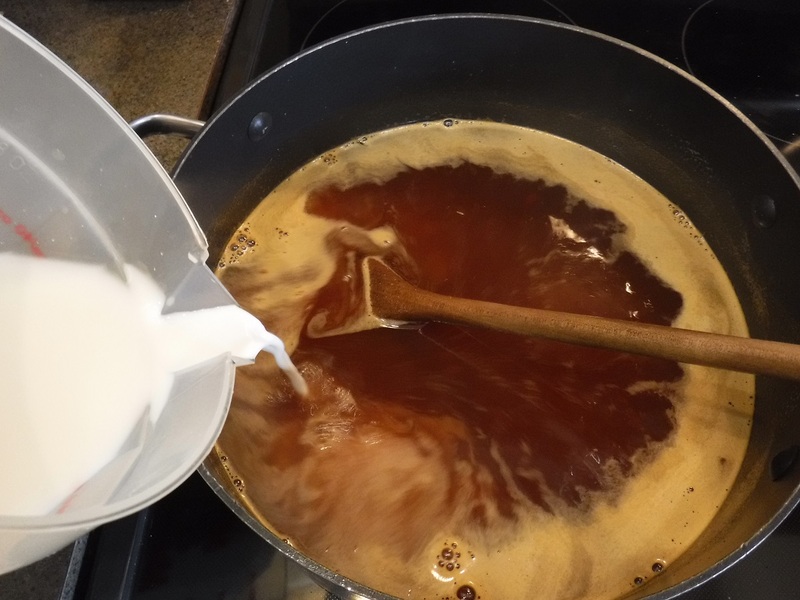 This recipe is basically for the liquid sauce. It makes a large batch part of which can be frozen for future use. 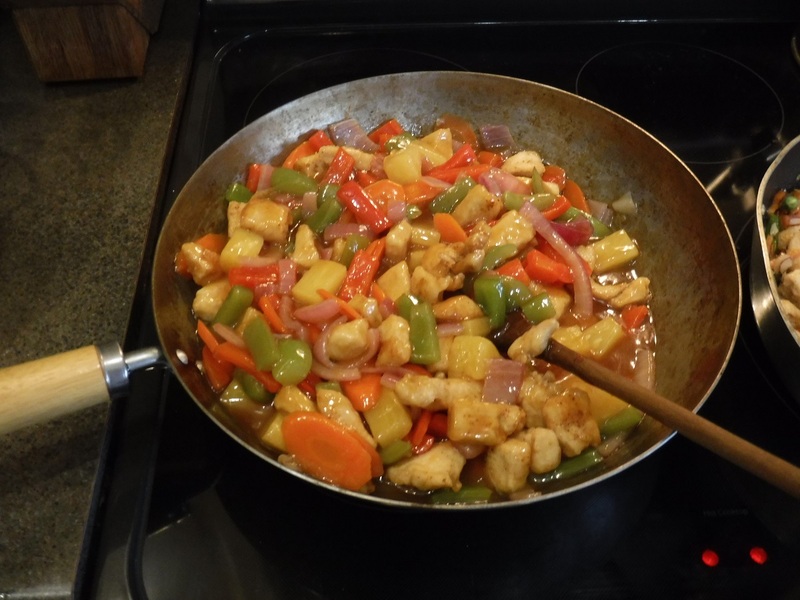 I will use part of the sauce, 2 1/2 cups, to make sweet and sour chicken and am including basic directions here with the sauce recipe. 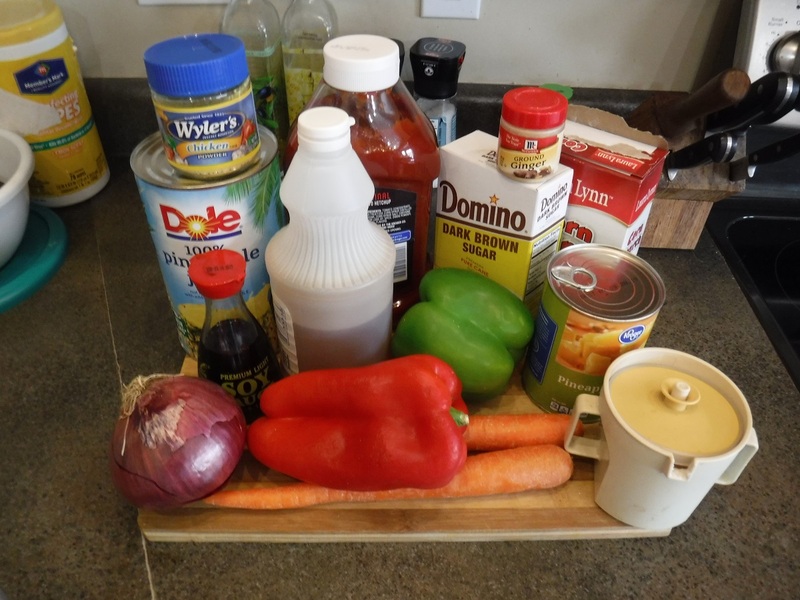 The vegetables are for the chicken and with the 2 ½ cups of sauce makes six to eight servings depending on side dishes. Mix the cornstarch and water and wisk to combine. Set aside. 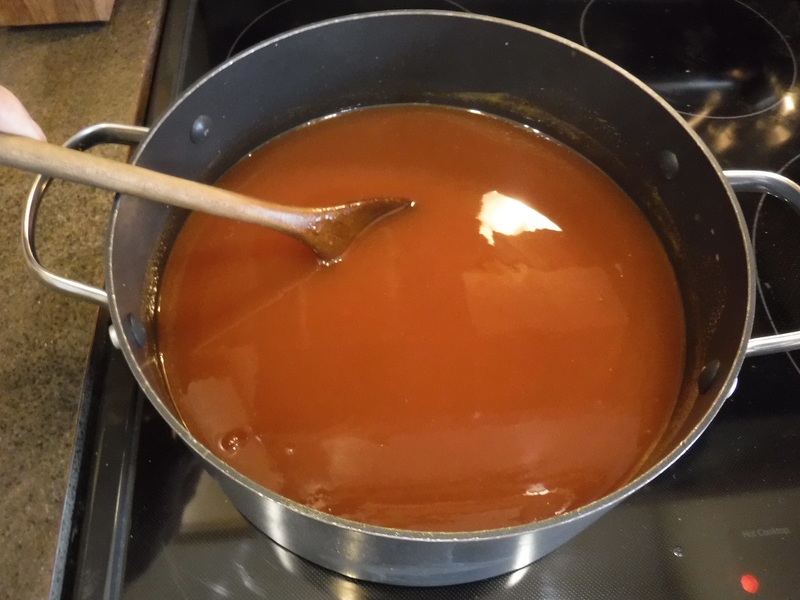 In a large pot combine the rest if the sauce ingredients and bring to a boil. Reduce heat and simmer while stirring to dissolve all solids and combine the ingredients. Simmer for about five minutes. Wisk the cornstarch mixture to recombine any sediment. Pour slowly while stirring into the sauce mixture. The sauce will start to thicken quickly. Continue to cook and stir until your preferred consistency, about five to ten minutes. Remove from heat and set aside. Prepare vegetables: Drain pineapple chunks. 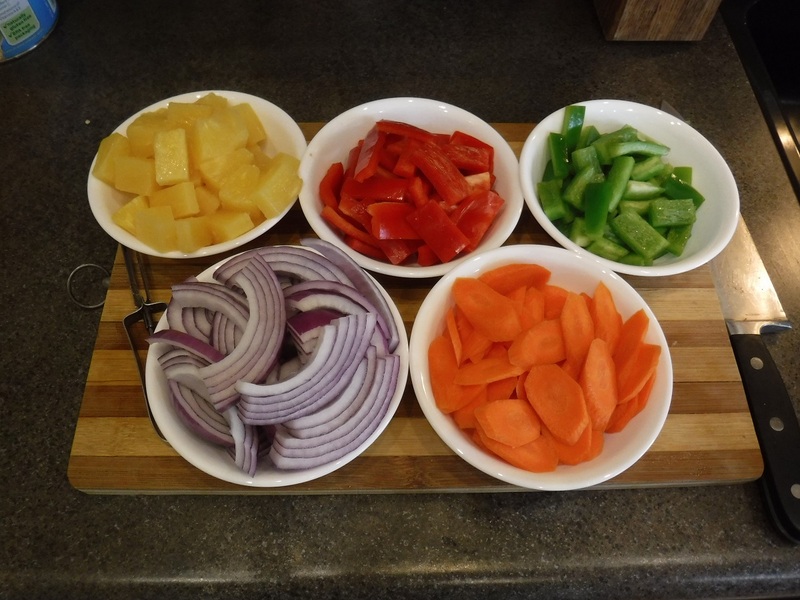 Peel and thin slice carrots diagonally to make maximum cooking surface. Clean and seed Bell peppers and cut into bite-sized pieces. Cut onion into bite-sized pieces. 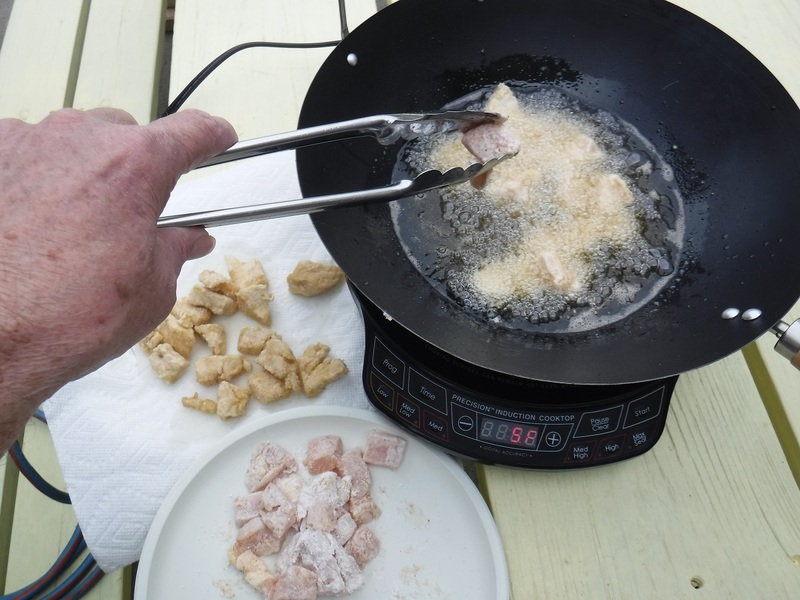 Cut chicken into bite-sized pieces. 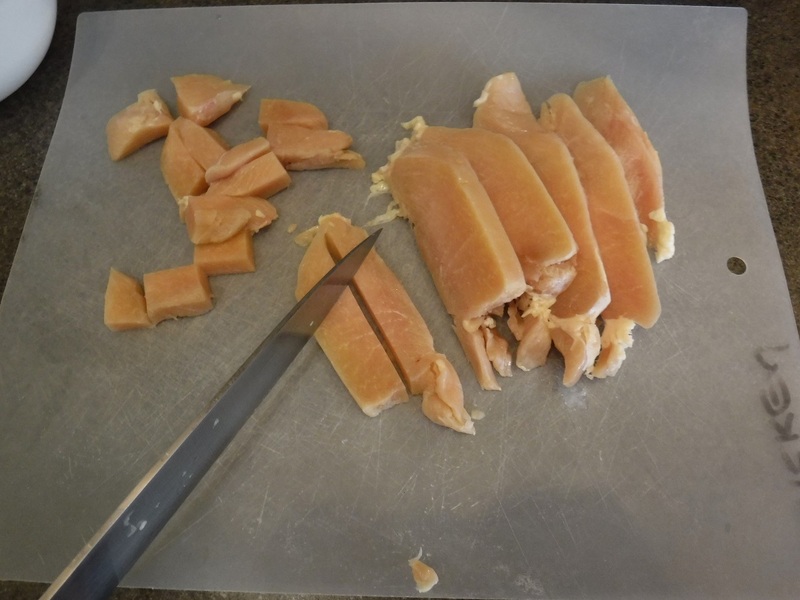 Partially frozen chicken is easier to cut. Pat chicken pieces dry. 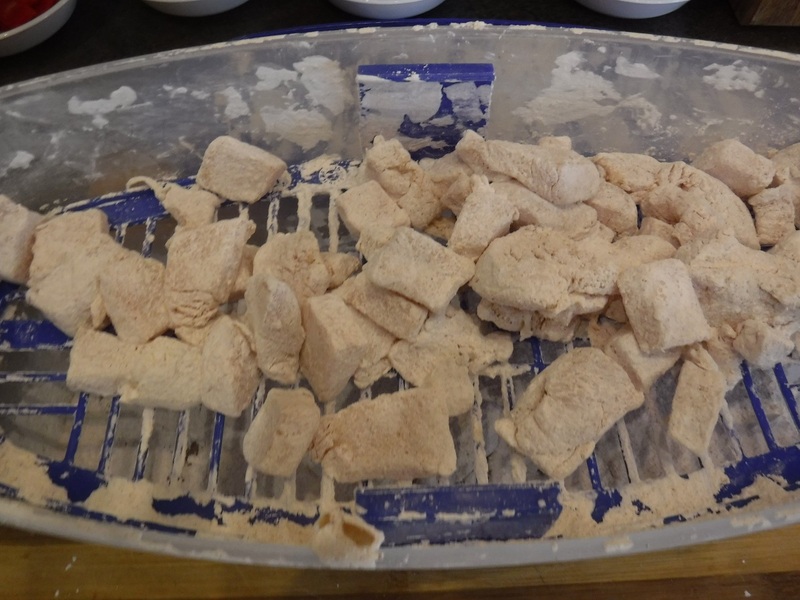 Coat chicken pieces with cornstarch by dredging, bag shake or breading box. Seasoning is optional, your choice. Here I used some ground ginger, onion powder, garlic powder and white pepper. Spread the coated chicken pieces on a plate or tray. Let rest for five or ten minutes to allow the cornstarch to adhere to the chicken. Fry in small batches in 375°F oil until golden brown, about five minutes. Remove to a tray with absorbent surface. Repeat with remaining cornstarch coated chicken. Heat your wok or frying pan. 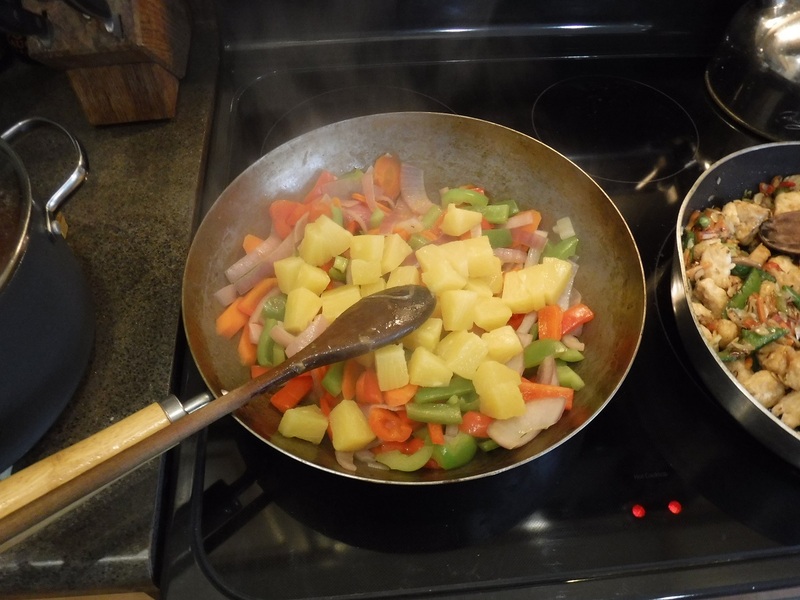 Add a bit of oil and add the vegetables but reserving the pineapple chunks. 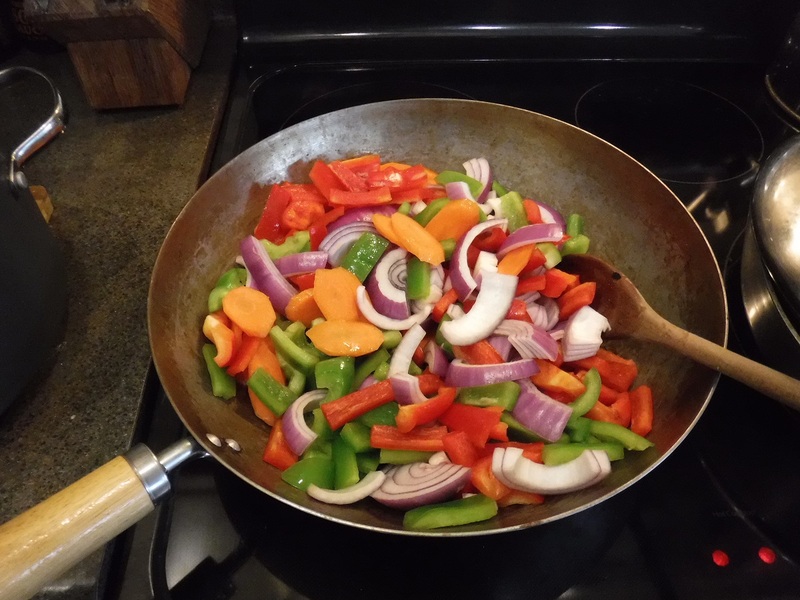 Add 2 tablespoons of water and cover to steam a bit or stir fry until the water is evaporated and vegetables softened. Vegetable crispness is a matter of personal preference. I cook until the carrot is just bite tender. Add the pineapple chunks and stir to combine. Add the reserved sweet and sour sauce and stir to combine and heat through. Add the reserved fried chicken pieces, stir to combine and coat the chicken. Remove from heat. 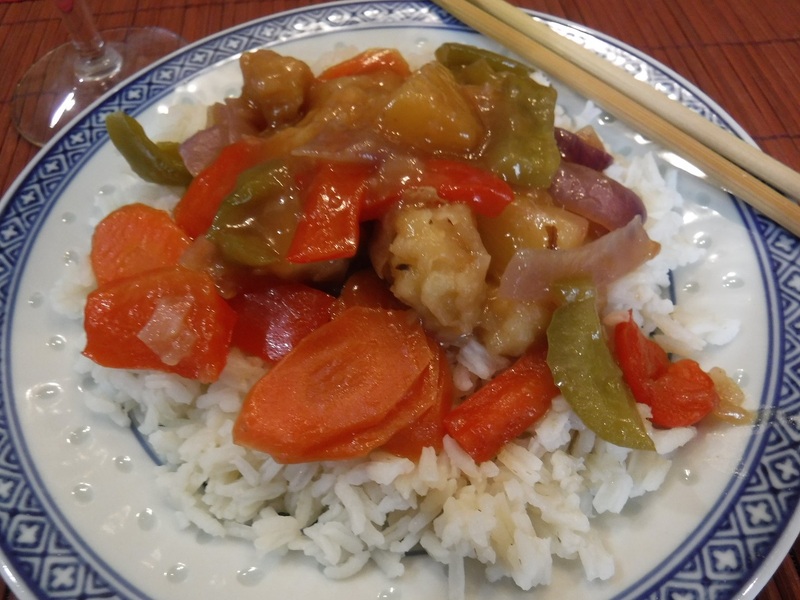 Make the sweet and sour chicken the star of the show and serve over white rice. Or, in a supporting role serve as a side dish with your other Eastern favorites. 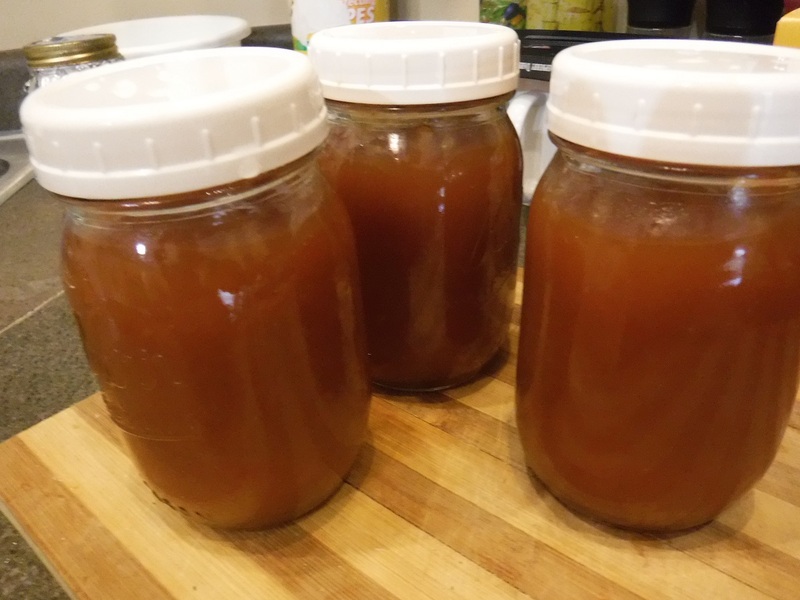 I store the remaining sweet and sour sauce in pint canning jars in the freezer. . 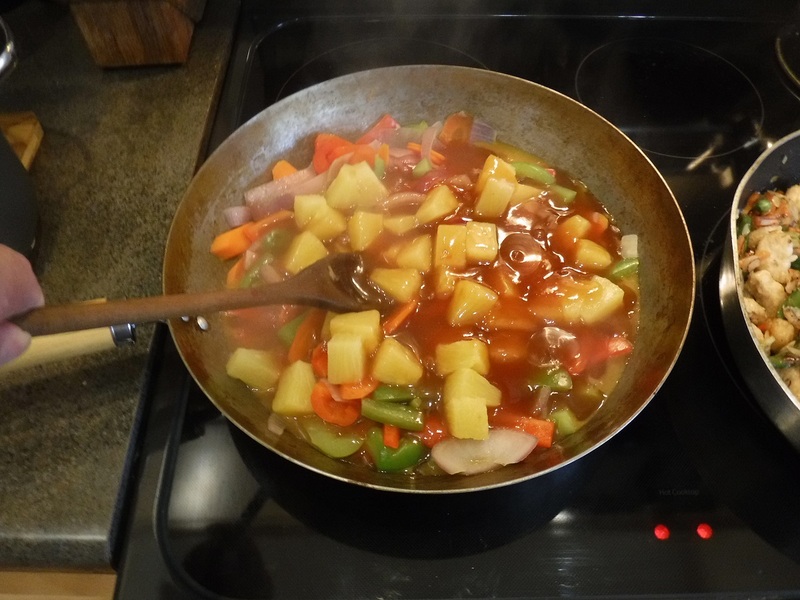 When I next want some sweet and sour all I have to do is stir fry some vegetable and add the already made sauce. Recipe makes about five one-pint jars of sauce.